When Prince died this month, it was reported that he hadn’t left a will — just an estate worth an estimated $300 million. 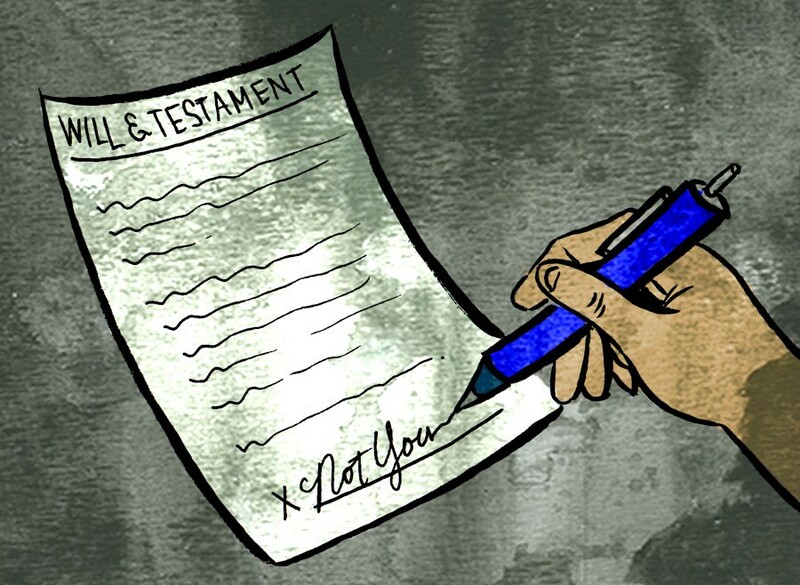 Drawing up a will is intimidating, and it involves hiring a lawyer, which explains much of why 55 percent of Americans don’t have one. But there is a lot of planning to be done before you even get to making a will, and that could be more immediately relevant (and doesn’t even require a lawyer to do). That’s right: Your credit card bill is still due if you’re in the hospital. If no one pays it you’re leaving yourself (or one of your loved ones) with an even bigger headache after you check out. If you’re incapacitated, above 18 and without a health care directive, you’re at the mercy of your doctors. Single, childless folks often mistakenly assume their parents can always act as next of kin and be able to make those decisions, but after you turn 18 that’s no longer true. The person to whom you’ve given power of attorney should keep a copy of your health care directive (as should your primary care physician). Robinson also gives her clients a card to carry in their wallet that indicates where to find the documents; other clients, she says, will carry them on a USB drive. You can also email the file to a trusted friend, or give access to friends and family on Google Drive. Whatever method you choose just has to be accessible in some form to do the “speaking” for you. Unlike a will, filling out a health care directive doesn’t require an attorney. Anyone can complete one using state forms — meaning you’ve got no excuse to get that out of the way. Now that the people who matter know what to do with you if you’re sick, it’s time to let them know what to do with your estate after you depart this earth. Even before you draw up a will, Robinson says you should make sure you’ve designated beneficiaries on your 401k, IRA, or life insurance policies and that they’re up-to-date (i.e., don’t accidentally leave your money to an ex or ex-best-friend). After that’s done, you’re ready to find an attorney to draw up your will. You can expect to pay between $400 and $1000 for a will. (Pretty much any lawyer can do this: Look for one on Martindale, a search engine for law firms; ask a friend or relative; or check with a local bar association). However, it’s not a one-stop process: you need to check in with your attorney every year to make sure you’re compliant with laws and manage any changes to your estate and your life, like a marriage or the birth of a child. One of the key decisions to make is how to divide your assets. You can leave your estate to one person or divide it by percentages or dollar amounts. You also need to think about your digital assets — who will have control of your passwords and online accounts? Do you want your social media deleted, suspended, or posthumously updated? These choices are personal, and a lawyer will help you determine what is essential for your specific situation. Another important decision is picking an executor, the person who carries out the will. Robinson also suggests you pick a backup executor in case the first person is unable to carry out the will. This person can be another family member, a friend, or even a lawyer or professional trustee service. In a case like Prince’s, when no will exists, state inheritance laws will take over, opening the door to court challenges. As the line of inheritance follows the deceased’s family tree down from siblings to nieces and nephews, sometimes more distant family members can end up with a check. “Very often it ends up going to someone the person wouldn’t have wanted to receive their estate,” said Robinson. In the case of Prince, who had no spouse or children and a large estate, the government will take about half his fortune in taxes, with the rest doled out to his living siblings. If he had left a will designating heirs, estate tax laws would have allowed each of them to receive $5.45 million of that money tax-free—another very good reason to make sure you have a will. Rae Votta covers the world of digital entertainment for The Daily Dot and writes the newsletter ReadySetGrowup for financial tips. She previously interviewed an employee at Universal Studios’ new Harry Potter theme park.